Good afternoon, addicts! As I type this (12:30pm BBT), all HG's are sleeping, except for Aaryn. Elissa is in the Diary Room. Elissa/Judd had a conversation on the backyard couch this morning at 11:05am BBT. Nothing game wise, really. Elissa did some Amanda & Aaryn bashing, talking about Amanda's botox "wearing off" and how "gross" she is, etc. They then talked about Aaryn campaigning to stay and Judd said he's voting her out no matter what. Aaryn is putting on makeup. All other HG's sleeping. Elissa is in the kitchen. Aaryn still doing makeup. Other HG's sleeping. Judd/GM/Andy are talking in the bedroom. Judd is telling them about a dream last night. She walks into the bedroom where Judd/GM/Andy are talking and asks what they're all up to. Amanda leans up against the wall to blend into it..
Amanda said she's gonna go make eggs & asks if anyone else wants some. They all decline. She leaves the bedroom. Aaryn is in the bedroom now. Fun chit-chat all around. Talk turns to about how many HG's they have left & the jury will be 9 people. Judd/Andy/GM talking about Pandora's Box & wonder when Elissa will get the HOH camera for pics today. They said she already did her HOH blog. Elissa was just called to the Diary Room (to get her HOH camera for pics). Andy/Judd/GM get up for the day. Elissa is out of the D.R. with the HOH camera. Pics are being taken of the HG's. McCrae is getting up for the day. McCrae/GM/Aaryn are on the backyard couch talking non-game chit chat. McCrae is hoping something happens today. Judd just took a shower and is talking to Spencer/Andy in the bathroom, also non-game. GM is talking about how she thought the BB house was a real house, not a set. McCrae said the house looks different in person. Aaryn/GM/McCrae think that the backyard is big. Amanda comments that Elissa didn't ask her for a pic together. Talk turns to dreams: Amanda/McCrae are talking about their dreams last night...they had the same one. They both dreamed of turning their cell phones back on & but they died because they weren't charged. Amanda said that she forgot her charger at home. 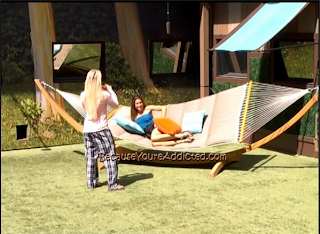 Elissa comes out and asks Amanda if she's getting in the pool because she wants underwater pics. 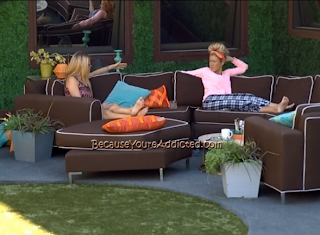 Amanda said yea, Elissa said she'll go put on her bathing suit. Amanda goes inside to brush her teeth. Aaryn/GM is telling GM that if Andy stays this week, he's gonna skate to the finals because nobody will put him up & vote him out. He's too well-liked. Aaryn also mentioned that Elissa always wanted a girls alliance. Aaryn is telling GM to throw a vote to her and if she gets 2 more votes, she'll stay. If she doesn't, she can always say it wasn't here who voted to keep her. GM suggests they talk to Elissa to try to work something out. Elissa/Amanda are taking pics of each other underwater and laughing at them. Judd just gave Aaryn a quick kiss on the lips. Talk turns the Kids Bop CD's. Andy: "If there was a kids version of "My Neck/My Back", I'd buy it." All HG's are in chill mode today. Not too much game talk so far. GM just told Elissa about Aaryn wanting to work with the girls. Elissa listened and said "I don't know." before they left the storage room. Elissa was freakin' GORGEOUS pre-botox. I watched the video on YouTube when she was on Anderson Cooper and was like whoaaa. so, so pretty. I hope Elissa gets a Pandora's box that some how saves Aaryn from leaving on Thursday! Sometimes it looks like her face is melting. Wil has her absolutely nailed. Ever notice that when Elissa closes her mouth, she INSTANTLY has ducklips? It makes her look like she's being sarcastic or petty even if she's just standing there. It's a shame. As much as I hate to see him go, I hope the house flips and keeps Aaryn so they can get Elissa out next week. Sooo, tired of her smug and "holier than thou" attitude. Andy definitely is the Jerry of this season after falling in the pool yesterday! Part of me does wonder if he did that on purpose though for attention/cam time. I wouldn't put it past him. Plus I can certainly see Andy going out in 3rd place in a number of scenarios so that'd be another similarity with Jerry. I'm not against plastic surgery. I'm against plastic surgery making you look like you're 15 years older than you really are--which is true in Elissa's case. Some people are blown away to discover how young she is. I'm also against people getting plastic surgery, like Elissa, and then saying that someone else is a bad person for wanting plastic surgery (like Aaryn). Elissa has admitted within my viewing on the live feeds that she does botox. The fact that Aaryn would like breast implants for her smaller-sized bust shouldn't be something that Elissa ranks on. Which she did... on camera. Elissa looks more like "Bubby" than Amanda did. total shocker. she looks mid-30's but I'm not sure if it's her outfits that makes her look that age or her looks, to be honest. I thought she was way older than that too! Poor girl. I watched the video for Anderson you were talking about, and yeah, she was way more attractive without all the botox. The weird thing with Elissa is sometimes she looks so pretty then other times not so much. I don't know why that is. I like her though, she doesn't seem all that bad to me. I think her "I'm better than you" attitude is just a defense mechanism for the way everyone treated her in the beginning. I act the same way around people I know don't like me so they get that I don't care what they think and that I like myself the way I am so your judgements do not matter. So what exactly is BB time? I have been watching for years, but just started looking at blogs this year. Feel stupid for asking, but what hours do they typically get up and around? Do they stay up late most nights? Basically, what's the schedule like compared to someone on the outside. BB time is California time. They are located in CBS Studio City. Now, there is no doubt that living 24/7 you would not always look your best! LOL But the botox and lip injections are WAY too much on Elissa - I can't stand the poofy lip thing. How do you look up the video you are talking about jamie? It's weird to see amanda and elissa laughing together! I thought Elissa hated everyone - surprised she would want pics! I think that if you look back on Elissa commenting about Aaryn wanting breast augmentation, she was talking more about the financial aspect of the situation & not on the surgery itself. The convo was about how Aaryn said she needed money & Elissa was talking about the choice of getting elective surgery when you have more pressing needs & how that was an unwise choice. ...laserkat: Which makes Elissa sound even dumber because Aaryn obviously didn't have as much money before the show as she would after she (presumably) won 500k. Not everyone is married to a dude who has a ton of cash to throw around for plastic surgery. I agree Rebecca, I just wanted to put the convo in context. She did not say Aaryn was a bad person for wanting surgery, just that her priorities were off. I am not saying I agree with her, I think everyone should decide for themselves how to spend their extra $$$. botox is certainly not plastic surgery and it is used for medical purposes... I'm not saying that is why Elissa did it, but we certainly don't know if it was or not. I don't know about the convo with Aaryn and Elissa over implants so I certainly can't comment as to what was said - but I don't think there is anything wrong or hypocritical about saying you either a) don't agree with it or b) that you have to think about the cost too. Granted, both apply to botox too if it's not medical and insurance doesn't cover it. Should be interesting to see if Aaryn can turn things around - if she'd truly work with Elissa and not go running back to Amanda I think it'd be a great game changer. Elissa wasn't discussing it with Aaryn, it was with other houseguests, with the obligatory "She's soooo disgusting", "I hate all these people soooo much" comments. It was almost like, dare I say it?.....she was passing judgement. O-M-G. The positive of a girl's alliance is that absolutely no one would ever see it coming. The negative is that there's a reason for that and that's cause it'd never happen or work with Amanda, Elissa and Aryan working together. The girl's alliance really would be beneficial for the ladies though. And I mean GM has been in on the talks with Judd, Spencer and Andy that their next 2 targets after Aryan are Elissa and Amanda. So that'd be 3 girls out in a row (5 if you take it back to Helen and Jessie and 6 in a row including Candice if you factor Judd was let back in) leaving just GM with the 4 guys and good luck with that. It's looking like the women will let a dominant numbers advantage go to the wayside cannibalizing each other since they've won all but 1 of the HOHs during that stretch. It could very easily somehow go from at one point a 6-3 numbers advantage for the girls to a F4 of all guys mostly cause the guys just sat back and let the girl's get catty and take each other out for them. I'd love to see Aaryn stay (for game play purposes) and Andy leave because I can't stand his flop-flopping but I understand that's his game that he is choosing to play. Would be interesting to see last minute deal making! It'd have to be a girls alliance minus Amanda because there's no way she'd separate from McCrae. PS - absolutely love the blog! A girl's alliance minus Amanda would be super smart. Elissa's obsession with Aaryn has blinded herself to the possibility though. I don't think it could work without Amanda. I don't see Judd and Spencer having any interest in keeping Aryan under any circumstances even if Elissa and GM asked them to especially since they can't say anything about a girl's alliance obviously. The only way I could see them getting the votes is if Elissa, Aryan and GM went and pitched it to Amanda using the info they have on the plan of Judd, Spencer and Andy that GM knows about and that the girls just can't keep picking each other off while the guys sit back and skate to F4 even though the girls are winning almost all the comps. Amanda kinda wants to keep Aryan anyway so the added benefit of a secret girls power alliance could push her over the edge to make a serious push to keep her. Then it would fall on Amanda to somehow convince McCrae to be the 3rd vote they'd need without mention of a girls alliance of course. That would probably be difficult but certianly doable and definitely the easiest most likely route to take to get the necessary votes to pull it off. McCrae is already thinking about a guys alliance behind Amanda's back so it'd be fitting if she beat him to the punch and did the same with a girls alliance. Well Amanda is a master manipulator, if anyone can make it happen its definitely her. She could make up a crazy story about Andy and have Mc believing it within minutes. I agree Brian...the sad thing about the women not being able to work together is that this happens all the time in real life. They are pitted against each other. Wait! Judd and Aaryn kiss? What???? Didn't she just blindside him out if the house a few weeks ago? Because us girls are catty, judgmental people. Anybody that disagrees with me is living in a false reality. If a house full of women got along ID say hell had just froze over. Can't wait to her what Julie Chen says to aaryn. I now I am not the only one. I was just going to comment on that!! Why hasn't anyone brought the fact that Aaryn and Judd just kissed on the lips. What was that about??? Unfortunately Julie can't really say too much at all because she made Jury so it's probably just gonna be a regular bland segment for the most part. If you notice before each eviction now she gives the disclaimer about not being able to reveal any info about the outside world. So she'll come out they'll put the applause sign on and everyone will clap and then she'll do the standard interview about why she got evicted, if there's anything she'd do differently etc. Maybe if we're lucky Julie will ask 1 generic question or so about issues arrising in the house from comments she made that were perceived as racist by fellow HG and/or her bed flipping fight with Candice. And Aryan will give some BS answer about things being taken out of context and blown out of proportion or something long those lines. But that would probably be about it especially since the firestorm is barely still lit at this point. Now if she had been evicted way back when instead of Kaitlin now that would've been must see TV. They probably would've had to pre-record that show to better control the crowd. I do wonder if they still might or if it's died down sufficiently enough where they don't even have to. My guess is Aaryn is banking that Judd would rather kiss her than Andy. She's trying to change his vote. If I were Aaryn I would go privately to Amanda and say look-You owe me a lot more than Andy based on the HOH's alone and that it would be best for her security going forward to let McCrae vote for Andy-but she deserves her vote. Also remind her that only one can win in the end and who knows how your man will act toward you outside of "the game". Pull out all the stops-get in her head that the guys will vote Amanda out before McCrae.